The all-new beta cycle of OS X El Capitan 10.11 for Mac devices has been started by Apple with its first seed of OS X 10.11.1 Beta El Capitan (Build: 15B17c) version ahead of official OS X El Capitan 10.11 final public release, schedule to be released on September 30th, 2015 this month. Currently, Mac OS X El Capitan 10.11 GM Candidate (Golden Master) is in the process. The Direct Download Link of OS X 10.11.1 Beta 1 .DMG File is available for upgrade / update and manual installation using iTunes. The most popular functionalities changes in the latest OS X 10.11.1 Beta 1 Update (15B17c) is the support of several Unicode 8 characters with new emojis icons, like of burrito, hot dog, cheese wedge, taco, unicorn head, middle finger etc. and also includes; revamped Mission Control powered by Split Screen mode, a new system-wide font, stability, performance, security improvements and bugs fixes. How to Install OS X 10.11.1 Beta Manually? If you're currently running an old OS X El Capitan version on your desktop PCs or laptop devices, then you can get official OS X 10.11.1 Beta 1 Update by simply head-over to Mac App Store >> Software Update option. Just like past practices, All OS X developers can go to OS X Dev Center website for official OS X 10.11.1 Downloads. If you're non-developer, then you can activate OS X 10.11.1 Beta 1 without OS X developer account and Apple UDID with iTunes for Free. 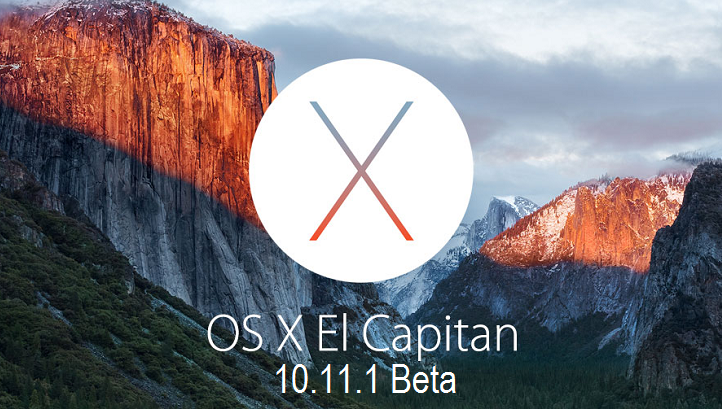 Just Download OS X El Capitan 10.11.1 Beta 1 DMG Update File via Direct Links available below.